Upon arrival in Guatemala City, guests are met & transferred in a private vehicle to Antigua. In the morning enjoy a private half day walking tour of Antigua. Afternoon private transfer to Lake Atitlan. Today guests have a private transfer to the famous market at Chichi. In Flores you will be met & transferred privately to your hotel in the rainforest. Today guests have a private transfer with guide to Tikal National Park. After lunch time to relax and refresh and fly back to Guatemala City and transfer to hotel. Upon arrival in Guatemala City, guests are met & transferred in a private vehicle to Antigua and to hotel. Guests will be met by our Textile Expert for a full day tour of Antigua & surrounding villages to learn about the famous Guatemalan Textiles. Guests will visit the Ixchel Textile Museum in Guatemala City, the fabulous Azotea Coffee Farm & Maya Traditions Museums. Today guests will stop in Solola to visit a women’s textile cooperation and shown the different weaving techniques and traditions of the area. Today guests will explore and shop at the famous market at Chichi. This morning guests will take a scenic boat ride across Lake Atitlan to the village of San Juan La Laguna where they will visit the women’s textile cooperative to see hand weaving and natural dye process. This morning our driver will transfer guests to the airport in plenty of time to catch their flight. Guests visit the local woodcarvers village, the Azotea Coffee Farm & Maya Traditions Museums. Today guests visit the colorful authentic market at Comalapa, local primitive painting galleries, murals and a local bakery. This morning guests will take a scenic boat ride across Lake Atitlan to the village of San Juan La Laguna to visit the women’s textile cooperative and admire hand weaving; homes of the celebrated naïf painters and the village of Santiago. Today guests visit the famous market at Chichi. Time for shopping and see Maya rituals. Guests enjoy a free morning to relax. After lunch they transfer to Yaxha National Park. Today we will will take a half day guided walking tour of Antigua. Free afternoon. Transfer through the highlands to the Lake Atitlan for a scenic boat ride across the lake to the villages of San Juan La Laguna and Santiago. Transfer to the famous market at Chichi. Time for shopping and see Maya rituals. Afternoon return to Guatemala City for flight to Flores. Today guests enjoy a tour to explore the amazing Mayan Temple site of Tikal. This morning guests transfer to Flores airport for a short flight to Belize City. Here guests pass through immigration and take another short flight to the beach location of their choice. Breakfast. Free day to relax at the beach or book tours locally. Upon arrival in Guatemala City guests are met & transferred in a private vehicle to Antigua. Guests will take a half day walking tour of Antigua. Free Afternoon. Guests visit the local woodcarvers in Jocotenango & the Azotea Coffee Farm & Maya Traditions Museums. Transfer across Guatemala towards the border with Honduras to the pretty colonial village of Copan Ruins. Free afternoon to relax or explore this town. Guests will be transferred to the Maya Site of Copan for a private guided tour of Copan Ruins. Transfer to the lush tropical area at Rio Dulce. Visit the beautiful Mayan Temple site at Quirigua en route to Rio Dulce. Cruise the Rio Dulce River through the central canyon and down to the Garifuna town of Livingston on the Coast. After lunch transfer to Yaxha National Park to explore this atmospheric lakeside site. 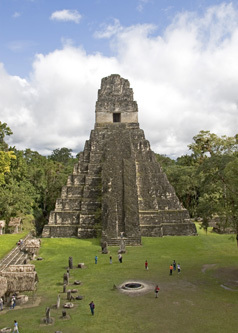 Today guests transfer to Tikal National park to explore the Temple of Tikal. Afternoon flight to Guatemala City.